Pledge $12 or more and remote-pilot a lunar rover! If you’ve ever yearned to take part in a space program but haven’t been given the chance, then perhaps you should take a look at the Remote Rover Experiment (RRE) Kickstarter campaign. Created by a team named Part-Time Scientists (PTS), the project aims to involve the general public in testing technology which will eventually be sent to the moon. 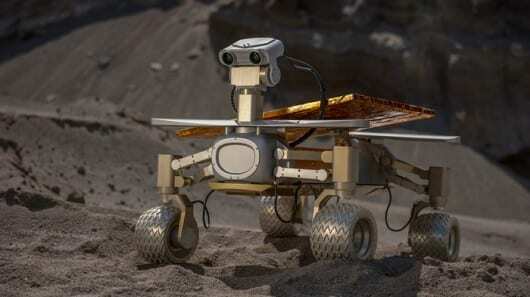 Available pledge points include the option to remote-pilot an Asimov R3A moon rover in an Earth-based location modeled after the Apollo 17 landing site, and the purchase of an Asimov R0 moon rover self-assembly kit. The 100-strong collection of hobbyists, hackers, scientists and engineers who make up the PTS team believe that space exploration should be accessible to everyone and the RRE Kickstarter project complements the team’s wider goal of taking part in the US$30 million Google Lunar X-Prize competition to land a rover on the moon. The RRE Kickstarter project brings to mind the ReMY project we previously covered but appears to be far more ambitious in scope. Pledges of $12 or more will secure a RRE Voucher which can be redeemed in order to allow the buyer to remote-pilot an Asimov R3A rover prototype over the internet, within a 200 square meter (2,152 sq ft) artificial lunar surface, conducting tests which will actually go toward preparing the Asimov rover for an eventual mission to the moon. The pilot can choose between two scenarios – a realistic but challenging “Commander” mode, or an easier and more fun “Explorer” mode. Upon completion, there will be a test-pilot certificate and the option to download a recording of the test. Those who pledge $500 or more will receive the same RRE Voucher, in addition to an Asimov R0 rover self-assembly kit. The Asimov R0 is said to be controllable from PC, Mac, tablet or smartphone via a self-developed Bluetooth protocol.